It's a restless, hungry feeling and Jack White's got it baaaad. Call it lust or call it love, whatever, its left the poor boy tossing and turning in his bed sheets. 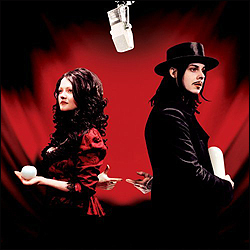 "Get Behind Me Satan," The White Stripes' fifth release, is a sultry and steamy affair -- the sound of the Jack and Meg wrestling a crawlin' king snake with rock n' roll's primal forces at their command -- Little Richard, Motown, Led Zeppelin. If justice and not commerce ruled the world, "Get Behind Me Satan" would banish Coldplay from the charts in the time it takes to dust Elmore James' broom. How old are you anyway?" Interestingly, the song betrays the use of some studio effects, underlining a significant difference between this album and their last, 2003's Elephant. Whereas the latter boasted "no computers" and was recorded at London's renowned Toerag Studios on pre-1963 analogue equipment, "Get Behind Me Satan" brings it back home to the more comfortable surroundings of Jack's own Third Man Studios in Detroit. Gone is the compressed intensity of Elephant's "Black Math" or "Just Don't Know What To With Myself," for a predominantly acoustic attack. As with an old Little Richard album, it's piano, not guitar that forms the cornerstone instrument throughout. The best cuts are the piano fueled numbers. "My Doorbell" kicks off with Meg dropping a Flintstone-like drumbeat while the piano kicks in. The melody, like an old Holland-Dozier-Holland Motown standard, digs its way into the cerebellum with the subtly of a jackhammer. Oh well, then do the twist"
Not quite Chubby Checker, but it's what the Stripes do so well- take the old and make it new. The Stripes inhabit a different planet from other indie bands. While they almost single-handedly kicked off the garage band revival over five years ago that has included The Strokes, The Hives and The Von Bondies, their contrary singularity soon forced them apart from the pack. Much of their aesthetic springs from the silt and detritus of the "old, weird America", that critic Greil Marcus identified in his book The Invisible Republic and musicologist Harry Smith captured on his highly influential Anthology of American Folk Music series. It's there on "Little Ghost", an Appalachian by way of the Violent Femmes tune detailing a longing for an apparition. Jack embraces his inner Robert Plant, throwing in a little coal dust from Loretta Lynn's front porch for his vocals. Whether it's Orson Welles or Blind Willie McTell, the Stripes have always flown their retro flag high. Two songs, the ballad "White Moon" and "Take, Take, Take", cite 40's silver screen star and one time spouse of Welles, Rita Hayworth and the red-hot punk-blues tracks, "Red Rain" and the infernal "Instinct Blues" blister with scorched intensity. And I get lonely, but I ain't that lonely yet"
As with other bass-less duos such as The Black Keys and The Kills, The Stripes sometimes chaff against their self-imposed limitations. The stiff marimba on "The Nurse" or the triangles on "Red Rain" cry out for a more nuanced delivery. But then again, that's the unique charm of the White Stripes. In the words of Nick Cave, another contemporary cultivator of "old, weird America", the Stripes strive to "keep it real, real, baby." By relying on a minimalist approach, "Get Me Behind Me Satan" keeps it raw and real while struggling to keep Satan and his minions at bay.